NFL football starts this week and so does another round of massive cvasino bonuses at Intertops Casino. Every week during the $150,000 Football Kickoff casino bonuses event hundreds of players will win thousands of dollars just by playing any of the casino’s amazing games. 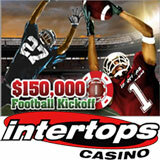 Intertops players earn points just by playing and are ranked by their point score on a scoreboard. Current player rankings, contest details and lots of American football trivia are available at http://casinopromotions.intertops.eu/footballkickoff. Intertops Casino has hundreds of real-money online casino games so no surprise they have an American football-themed slot, Fruit Bowl XXV . Intertops, which took the very first online bet way back when, has a casino, sportsbook and poker room, all popular all over the world. You can use the same account to play casino games or place an NFL bet in the sportsbook.